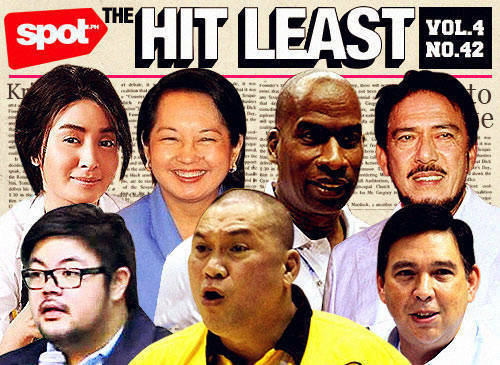 Plus, Pido Jarencio’s meltdown, Kris Bernal’s crossdressing, and more nutty tales. 1. OUR SENATORS CONTINUE THEIR DEBATE OVER THE CYBERCRIME PREVENTION ACT OF 2012. They say hindsight is always 20/20-but stupidity is like 24/7 CCTV. 2. THERE’S A WARRANT OF ARREST WITH ROBERT BLAIR CARABUENA’S NAME ON IT. Gee, we’re really good at catching small fish, aren’t we? 5. FORMER PRESIDENT AND CURRENT PAMPANGA REP. GLORIA MACAPAGAL-ARROYO FACES PLUNDER CHARGES ANEW AND HOPES TO REMAIN UNDER "HOSPITAL ARREST." The "little girl" has become some sort of a white elephant. <>7. 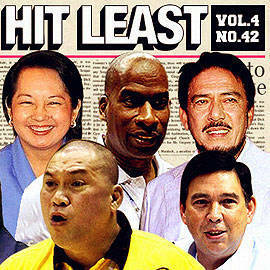 COMEDIAN-SENATOR TITO SOTTO SAYS HE’S GETTING STRESSED OUT AT THE SENATE. What a coincidence! We’ve been stressed out since you got elected there. <>9. AFTER LOSING IN GAME 1, UST GROWLING TIGERS BASKETBALL TEAM COACH PIDO JARENCIO CLAIMS REFEREES MADE UNFAIR CALLS AND MAKES PASSIVE-AGGRESSIVE COMMENTS AGAINST ATENEO BLUE EAGLES COACH NORMAN BLACK (ATENEO EVENTUALLY ENDED UP WITH THE CHAMPIOSNHIP TITLE). Memo to Mr. Jarencio: Ball don’t lie. <>10. SEN. RALPH RECTO CHAMPIONS A "WATERED-DOWN" SIN TAX BILL, SAYS LIQUOR AND CIGARETTES HAVE TO BE KEPT CHEAP. Cancer for all seasons, anyone? <>Art by Warren Espejo, with screenshots from various news clips and publicity stills.